Arrests were also made in Pennsylvania, New Jersey, Nevada, Northern California, Los Angeles and Orange County. 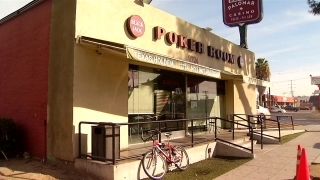 Federal officials raided two card rooms in San Diego County and issued arrest warrants for 25 people in connection with an alleged conspiracy to launder millions in profits from high-stakes poker games. Law enforcement officials raided Seven Mile Casino on Bay Boulevard in Chula Vista and the Black Jack Palomar Casino on El Cajon Boulevard and Oregon Street before 9 a.m., seizing more than $600,000 in player accounts and bank accounts. Arrests were also made in Pennsylvania, New Jersey, Nevada, Northern California, Los Angeles and Orange County. Charges ranged from illegal bookmaking, money laundering and failing to report winnings to federal authorities. Federal prosecutors claim David Stroj, aka "Fat Dave," of San Diego, hired people to recruit clients to the high-stakes games several times a week and then conspired to launder the money through local card rooms. Stroj faces federal charges of running an illegal bookmaking, poker and blackjack business as well as money laundering and transporting someone from Mexico to California with the intent to engage in prostitution. He had not been arraigned by Wednesday afternoon and it was not immediately clear if he had an attorney. Prosecutors claim Stroj would have bookmaking clients write checks to the card rooms so it would be deposited into another player's account. Federal officials say that money would then be withdrawn in cash or chips. This also occurred with the Wynn and Bellagio casinos in Las Vegas, federal officials allege. "Fat Dave" took approximately $2 million a month in gambling activity, making about $500,000 profit, federal officials claim. The four people arraigned in federal court Wednesday allegedly recruited clients from the Barona Casino, Las Vegas and Mexico on behalf of Stroj, according to prosecutors. They pleaded not guilty in court. Craig Kolk, Ricardo Castellanos-Velasquez and Duy Trang were granted bail after their court appearance. Ali Lareybi was detained pending a hearing on Friday at 10 a.m.
Seventeen other people were in custody. Four were fugitives and warrants have been issued for their arrests. The operator of the Palomar Card Club, Naseem "Nick" Salem, is accused of failing to track winners earning more than $10,000 a day. “All financial institutions include casinos are required to report any cash transaction over $10,000,” said Joshua Mellor, assistant U.S. Attorney. Prosecutors also claim Salem moved money around on an illegal blackjack and poker business so he would escape detection. Harvey Souza, owner of Seven Mile Casino, was arrested Wednesday at his Bonita home, accused of not keeping track of who won more than $10,000 a day at his casino. “They were not duped. It was criminal in nature,” Mellor said. 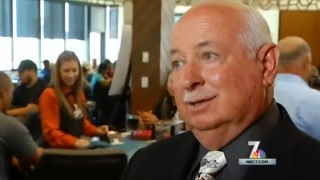 Souza spoke with NBC 7 when the card room opened in July. Unlike tribal casinos, card rooms do not offer slot gaming. Patrons enjoy games like blackjack, baccarat, pai-gow and poker. At the time it was one of only four in the county with two in San Diego and one in Oceanside. "Seven Mile Casino, owned and operated by Harvey Souza and his family, have worked tirelessly for the past 70 years to build upon their great-grandfather’s legacy and comply with the evolving regulations regarding card rooms across the state. As a family and as a business, they are very much invested in the community of Chula Vista and the industry. We look forward to working with the California Bureau of Gambling Control to resolve all issues." California’s Bureau of Gambling Control issued Emergency Closure Orders on both the Palomar and Village Club card rooms effective immediately. The locations will be closed until they meet certain criteria to potentially reopen, a spokeswoman for Attorney General Kamala D. Harris said. “These casinos engaged in money laundering and illegal gambling schemes that undermine the well-being of our communities,” said Attorney General Kamala D. Harris in a statement. “I thank our California Department of Justice Bureau of Gambling Control Special Agents, as well as our local and federal law enforcement partners, for holding the alleged perpetrators accountable for their financial crimes." Harvey Souza talked with NBC 7 the day his Seven Mile Casino opened in July 2015. Other defendants named in the indictment include: Matthew Greenwood, Jeffrey Broadt, Jeffrey Stoff, Arturo Diaz-Ramirez, Jaime Behar, Robert Stroj, Jean Paul Rojo, Joshua Jones, , Alexandra Kane, Bryan Sibbach, Joseph Palermo, Thomas Mallozzi, Stephen Bednar, Christopher Parsons, Jeffrey Mohr, Kyle Allen, Michael Hipple and Alfredo Barba. The investigation was launched two years ago by the California Department of Justice, Bureau of Gambling Control. The agency worked with the U.S. Attorney's Office, the California DOJ Indian and Gaming Law Section, the FBI, the IRS, HSI, and the San Diego Sheriff's Department during the investigation. The Palomar Card Club was in danger of being shut down earlier this year when state gaming officials accused owners Donald and Susan Staats of transferring their license to their daughter. The Staats' business license expired on Nov. 30, 2015 according to legal documents.